As Finals weeks go, it was an atypical one for the MoS forecasters, with only just over one half of the Head-to-Head Tipsters registering even a single correct tip, the Margin Predictors registering an average mean absolute error (MAE) of 59.4 points per game, and all but C_Prob amongst the Head-to-Head Probability Predictors registering negative probability scores. By way of context, before this weekend MoSSBODS had averaged 71% accuracy in all Finals since 2000, and had a sub-30 MAE for those games. Anyway, the Head-to-Head Tipster race was already over, with ENS_Linear and Bookie Knows Best confirmed for 1st and 2nd place finishes respectively. There will be a fight over 3rd place next week, however, with any of MoSHBODS_Marg or the RSMP twins capable of snatching it should they, alone, tip the Grand Final winner. Bookie_Hcap has, similarly, shored up 1st place amongst the Margin Predictors, and Bookie_3 and Bookie_LPSO 2nd and 3rd places, bar for some unusually divergent forecasts. There are possibilities for some moves further down the Leaderboard, with MoSSBODS_Marg and ENS_Linear potentially swapping places and, likewise, the RSMP twins capable of reversing their order. And, finally, the rankings of the Head-to-Head Probability Predictors also seems highly likely to remain unchanged. Two bets for one win and one loss this week, the net result of which saw the Combined Portfolio increase in value by, in rounded terms, nothing at all. 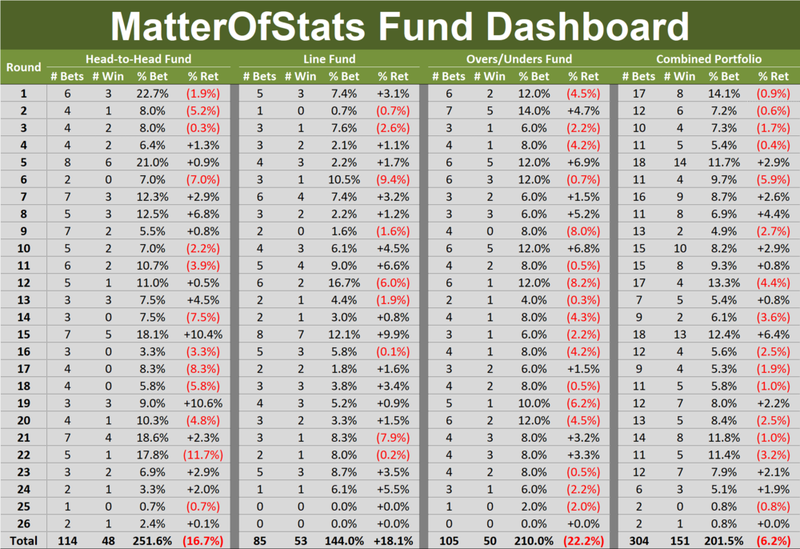 That left the Combined Portfolio still down by 6.2c on the season from a -3.1% ROI on about a 2.02 turn.